Aroma diffusers or essential oil diffusers are similar to scented candles but are much safer because they don’t use fire. You can enjoy a variety of different scents that can help promote better sleep or boost our immunity. But with different aroma diffusers on the market, it can be challenging to choose just one. So we’ve come up with a few pointers to make sure you choose the best one, and we’ve also done the research to bring you the best aroma diffusers you can find online in the Philippines. Let’s start with a few things you’ll need to know in order to choose an aroma diffuser. If you want to try aromatherapy but aren’t ready to dish out a lot of cash, then we suggest getting a heat diffuser, more commonly known as an aroma pot or lamp. Heat diffusers evaporate the oil using heat produced by fire or electricity, so the fragrance fills the room. They’re usually cheap and available in different designs to suit different interiors. Their gentle scent combined with a dim light will help you relax, making it perfect to use before sleeping. Just take note that the scent may be quite weak, so it’s best used for smaller rooms. It’s also not recommended for households with children or pets as they may knock things over. Ultrasonic diffusers use ultrasonic vibrations that break up the molecules of the essential oil and disperse it into the air as a fine mist. The fragrance will spread throughout the room quickly, but since the oil is diluted in water, the fragrance is weaker. Ultrasonic diffusers are recommended for those that want to remove unwanted odors or create a spa-like ambiance. Just make sure to clean it regularly as mold and bacteria can grow in the water reservoir. They can also double as humidifiers, and there are some ultrasonic humidifiers that allow you to add essential oils into them. The key difference being humidifiers will produce a weaker fragrance. Unlike the first two types, nebulizing diffusers do not need to use heat or water. Pressurized air is used to force the essential oil molecules up through a small tube, also known as an atomizer. The molecules are then diffused into the air as a fine mist. This is the most effective way to maximize the benefits of your essential oils. We recommend these for people who want to enjoy the natural scent and therapeutic properties of essential oils. However, most nebulizing diffusers use a motor which can be noisy, so make sure to check the reviews or product description. It also uses up more essential oil, so only get this if you’re ready to spend more. Ultrasonic diffusers have to be cleaned regularly. It uses water which makes it easier for mold or bacteria to grow, which might affect the scent of your essential oils. After each use, drain the water and give the reservoir a quick wipe to avoid build-up from forming. We also recommend doing a thorough cleaning once a month. You can use a mixture of vinegar and water or a special cleaning solution to clean the residue from the essential oils. You can also use rubbing alcohol and cotton to clean and disinfect the water reservoir. If you’re not fond of cleaning then we don’t recommend getting an ultrasonic diffuser. Other types of aroma diffusers will need less maintenance, but it will also depend on the product itself. Make sure to always check the box for instructions. To stay on top of the market, similar products compete by adding extra features that most customers would want to have. Let’s check some of them out. There’s the regular timer which allows you to set how much time a diffuser runs before it automatically shuts off, and there’s an intermittent timer which turns on and off continuously for a specified time before completely shutting off. This allows you to save more electricity and essential oil while still keeping your room smelling food. Timers are recommended for people who plan to use them unattended for long hours–like during bedtime. 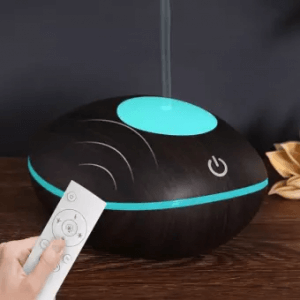 If you want to take your aromatherapy to the next level, some diffusers come with speakers that you can connect your device to and play relaxing music. There are also some that have relaxing ambient music built-in you can play with the click of a button. This feature may not be a priority, but wouldn’t it be nice to have the option to play some music during your spa session at home? Aroma diffusers are supposed to help you relax, so choosing a design that matches your interiors can make a big difference. They come in different shapes, colors, and designs, so make sure to choose something that matches your style. It probably won’t be as effective when your aroma diffuser sticks out like a sore thumb. There are also aroma diffusers that come with color-changing LED lights that you can turn on and off. You can also use this as a night lamp while you sleep. These lights are usually designed to help you relax and calm down. Now that you probably more or less know what you’re looking for in an aroma diffuser, let’s take a look at some of the top products we’ve found online. If you’re not looking for anything fancy and just want to enjoy the fragrance of your essential oils, then this aroma lamp might be for you. It can also serve as your home decor while you’re not using it. Just make sure to keep children and pets away from this as it can easily break. There’s nothing more stressful than heavy traffic on a Friday night when you just want to go home and relax. To make the experience less horrible, why not use this aroma diffuser to help you relax during traffic. It uses a USB plug, so you can plug it into your power bank or laptop. If you’re looking for a nice aroma lamp for your room, then this might be perfect. It also comes with a free essential oil (scent unspecified). It just might be difficult to set up, but luckily the product description page comes with picture instructions. You can choose from two mist modes (as shown in the picture above) to control how much mist is diffused into the air and how long you want the water in the tank to last. This way, you can also limit how much essential oil you use each time. Don’t you just hate having to stand up every time you need to switch things off or on? This aroma diffuser comes with a remote, so you can change the settings from up to 6 meters away. It also comes with an intermittent timer option which can save you electricity and essential oil. Don’t have a lot of space to place an aroma diffuser? Then this one is perfect for you. It’s small enough to fit in the palm of your hand, so you can surely make some desk space for it. Just don’t go overboard with strong fragrances as it might bother your officemates. This cute aroma diffuser comes is available in the colors black and white, making it easy to match with (almost) any interior. Although it can only run up to 4 hours on the weakest mist mode, it’s still safe to use during bedtime thanks to its auto shut-off feature that’s activated once the all the water is used up. Switch this device on just with two taps! Tapping it once makes it go on standby mode, another tap within the next 5 seconds will turn the device on, and an additional three taps will turn the device off. It also comes with a remote control that controls the amount of mist, the brightness of the lights, and the timer. This aroma diffuser is made of natural wood and hand-blown glass, making it an elegant and stylish addition to your living room or bedroom. It has a smart knob that allows you to control how much mist is dispersed into the air. It also automatically runs on an intermittent timer, so you won’t need to worry if you forget to turn it off. This aroma diffuser functions just as good as any other one but is more convenient thanks to its wireless operation options. You can either install the Oitmm app on your smartphone to control it from anywhere or connect it to your Google Home or Alexa to enable voice commands. Whether you just want a better smelling home or a nice relaxing ambiance, there’s an aroma diffuser for you. Just make sure to choose one in line with your needs and not just your wallet.